"I always believed that two best things in this world are traveling and playing music. And I always loved the cosmos. The Cosmos is the most epic thing ever. It's beyond space and time. It's everywhere, it always was and it always will be. What could be better than traveling among the planets and playing gigs on starliners. 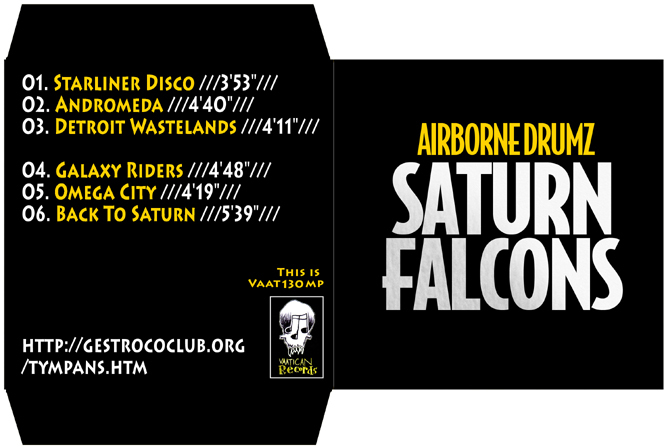 Saturn Falcons is the space band in the near future. They live the best life, fighting giant octopuses, trading rainbow crystals and, of course, playing concerts on big spaceships. When u listen to the album, just know that everything was recorded on cosmic guitars and computer musical instruments of the future right on The Ghost of Jupiter Terminal Station. I watched a lot of 80s sci-fi movies to make my concept more detailed. Escape from New York, Videodrome, Scanners, Spacehunter, so on so on. I tried to feel the atmosphere of the time. As a result, i got a lot of 80s emotions for my tracks. Each one has it's own small story. Rich robots and aliens in golden spacesuits having a party while Saturn Falcons playing their hit Starliner Disco. Then, the red lights of Omega City blinding the exhausted crew of a shuttle which traveled to Mars for years. And, finally, the band plays Back To Saturn supporting Andromeda Forces who are going to have an epic battle with Cassiopaeans in hyperspace. My last album was about Red Planet, this one was inspired by green and orange Saturn Rings, next one.. who knows.. maybe it'll be about the Horsehead Nebula.